Hi, everyone! Late start to the blog this week! I was a little under the weather, but I’m doing better now. So we’re supposed to get hit with a bunch of snow here in central PA. Of course my son is praying for no school. This would be the 3rd time he misses a kids’ paint & party because of snow. That would be a bummer. Although both of us enjoy being snowed in. Probably because we don’t have to shovel. I think next year will be his year to start, though, and he won’t enjoy it so much! I’ve got a couple more St. Patrick’s Day manis for you. This one is just a simple 2 coats and done. When using a polish with a high glitter density, you may want to use the foil method to remove it. This is when you soak a piece of cotton ball in acetone and wrap a piece of foil around it to hold the cotton in place. OR, you can buy these awesome rubber tips. You soak half a cotton pad, wrap it around the tip of your finger and slide the rubber thing down. It’s SO much easier. Lemme find a link for yas…… Ok, so they’re actually silicone. This is what I have- http://www.bornprettystore.com/5pcs-silicone-nail-polish-soakies-soak-caps-reusable-polish-remover-wraps-manicur-p-39658.html They’re super cheap and well worth it if you like using glitter polishes! That’s all folks! 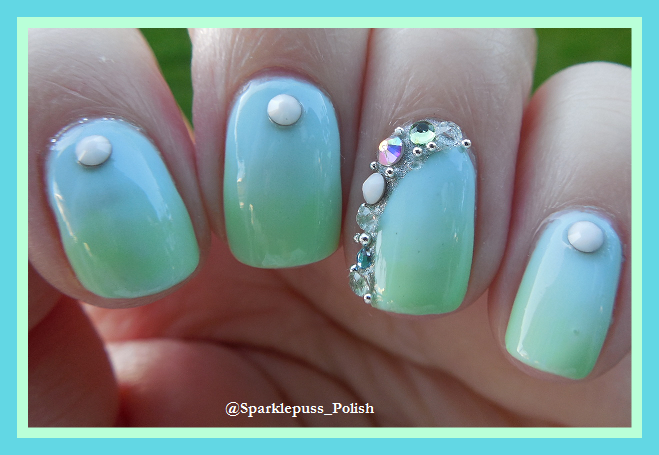 I’ll have my next green mani for you tomorrow! This is one of my favorite greens from KBS! It’s so juicy and perfect for summer. I don’t remember this KB! It’s so pretty! OMG, this is so gorgeous. I love green and this is such a great shade! That green is SO bright! Whoa! This must be an oldie. So fun!